“Jump Start” Manga Update – Three Series Have Joined Magazine’s Regular Lineup – Nigorimasen! I wrote a post in February about the first three manga series in Weekly Shonen Jump‘s 2017 “Jump Start” program, which were We Never Learn, U19, and Demon Prince Poro’s Diaries. Since then, three more series have had their own three-chapter trial runs – Hungry Marie, Dr. Stone and Robot x Laserbeam. After Viz weighed the reader survey results for all six series, they added Dr. Stone, Robot x Laserbeam, and We Never Learn to the magazine’s regular lineup. 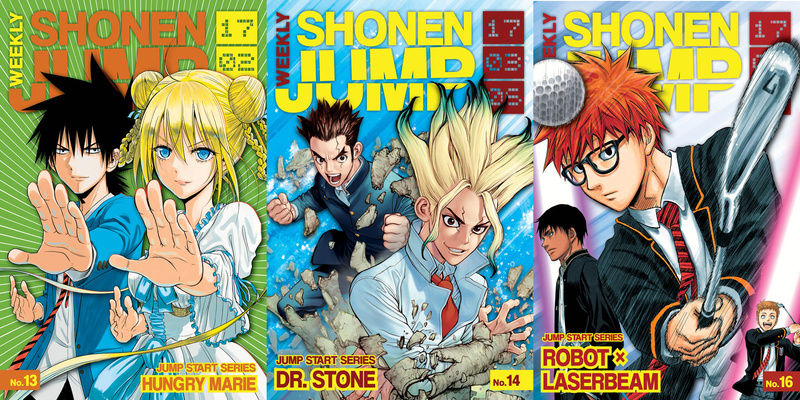 The first three chapters from all the Jump Start series are available as free chapters on Viz’s website. In this post, I discuss the following chapters: Hungry Marie chapters 1-3, Dr. Stone chapters 1-9, Robot x Laserbeam chapters 1-7, U19 chapter 3, Demon Prince Poro’s Diaries chapters 2 & 3, and We Never Learn chapters 4-9. I have enjoyed reading all six of those series up to now, some more than others, and would like to see them get digital volume releases in the future. A reminder for the images below: manga is generally read from right-to-left! A brief explanation of the plot setup in Hungry Marie. Teenage boy Taiga lives with his family’s Taoist temple that is next to a church. The church’s priest and the priest’s daughter are part of the Sagimiya Clan, who have tried for centuries to bring back the soul of Marie-Thérèse Charlotte (a daughter of Marie Antoinette). However, something goes wrong during their attempt to revive Marie-Thérèse using Taiga as a sacrifice and Taiga & Marie become mixed in body and soul – Marie is awake in Taiga’s body when Marie is hungry while Taiga is alert in Marie’s body when she’s not hungry. Ryuhei Tamura is best known for creating the Beelzebub manga. A mysterious incident turned all humans and some animals on Earth to stone. High school students Senku (a highly-scientific mind) and Taiju (a passionate but not-so-smart guy) come back to life over 3,700 years later and try to rebuild civilization. Senku concocts a revival fluid that reverses the petrification effect and the two boys decide to revive strong student Tsukasa and Taiju’s crush Yuzuriha. A conflict soon develops between Senku and Tsukasa over how civilization should be rebuilt: Senku’s technology-focused approach or Tsukasa’s nature-focused approach. 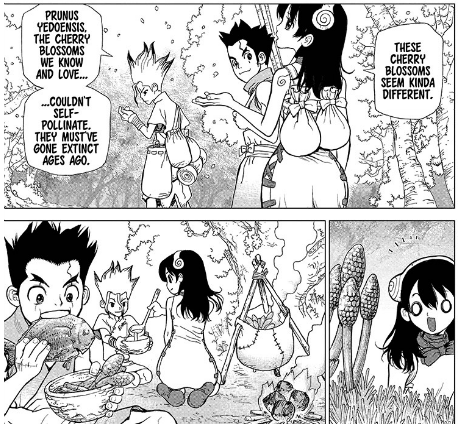 Senku’s scientific endeavors add a light educational element to the manga with his explanations of chemical processes and other things. He also has some verbal habits, such as calling Taiju a “big oaf” and being “ten billion percent” confident about things. Riichiro Inagaki wrote Eyeshield 21 and Boichi created Sun-Ken Rock, which has similar main character designs as Dr. Stone. 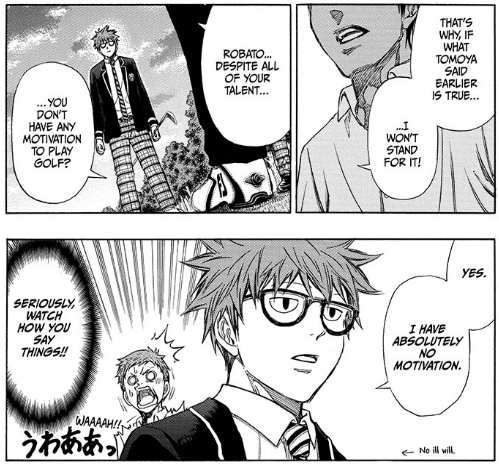 Robato’s lack of motivation to play golf in Robot x Laserbeam. Fujimaki created the Kuroko’s Basketball manga and has made another manga series featuring an impassive high school student. This time, the main character is straight-faced Robato Hatohara, who can make accurate golf shots but has no interest in actually playing golf. Tomoya Nakata (Robato’s classmate) tries to convince him to join the school’s golf team and Yozan Miura (the golf team’s captain) challenges Robato to a three-hole match to gauge Robato’s abilities. Whenever I read chapters of this, I imagine Tomokazu Sugita would be a good voice casting for Robato’s deadpan lines. U19 ended its trial run with Eiji using his Libido power for the first time and Eiji’s introduction to a group of Garage Kids, who are rebel students trying to overthrow the government. This manga showed thematic potential in its first three chapters and I’d like to eventually read the rest of it after it finishes. Poro continued to learn things about the human world in Demon Prince Poro’s Diaries. He encountered a demon who possessed his school’s strict hall monitor and a strong demon girl desiring to be Poro’s future wife. I suspect later chapters will also have Poro dealing with other demons aiming to bring him down or convince him to return to the demon world. In We Never Learn, a student-athlete swimmer named Uruka Takemoto became another student for Naruyuki to tutor. Her addition brings the manga further into harem-ish comedy territory since she has a crush on Naruyuki from their junior high school days and also because there continue to be awkward moments of misunderstanding involving Naruyuki and the three girls he is tutoring. Naruyuki’s teaching approach is an admirable one: he tries to frame unfamiliar concepts in ways that play to a particular student’s strengths. I like all four main characters, which helps me bounce back from the manga’s more embarrassing moments, but my favorite has remained the straight-forward Rizu. Tagged Demon Prince Poro's Diaries, Dr. Stone, Hungry Marie, manga, Robot x Laserbeam, Shonen Jump, U19, We Never Learn, Weekly Shonen Jump.